Preheat oven to 375°F (350°F for a dark or nonstick baking sheet). Unroll crescents on a baking sheet and divide along perforations into individual pieces. Place a scant teaspoon of Nutella™ near the wider end of each crescent in the center. Roll up dough from the wide end and shape into crescents. Bake crescents until puffed and golden brown, about 10-12 minutes. Remove from oven and serve immediately. So, um, apparently I've been living under a rock like a hermit with her stash of boring old cookies because THIS. This had been absent from my life and I had no idea what I was missing – until recently, that is. And me and my hermit-y self are never going back under that rock again (even if there are cookies in there). I suppose you're wondering what the hey-hoo I'm talking about. Nutella Crescents, THAT'S WHAT. 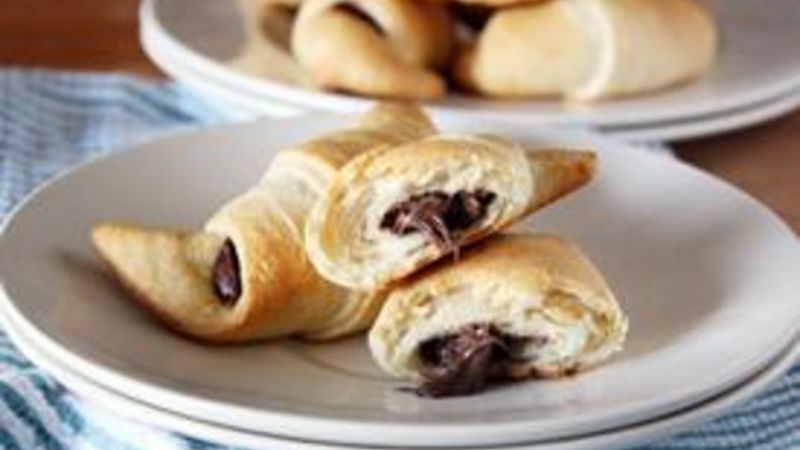 Puffy, buttery Pillsbury crescent rolls stuffed with chocolate-hazelnutty goodness. This is pretty dangerous stuff, right here. Like, I-want-to-make-a-perfume-that-smells-just-like-these-Nutella-crescents-being-baked-in-the-oven dangerous. Like, I-want-every-morning-to-include-sunshine-and-birdies-and-these-Nutella-crescents-for-breakfast dangerous. Like, I-will-go-to-the-gym-every-single-day-for-the-rest-of-my-days-just-so-I-can-eat-these-Nutella-crescents-all-day-every-day dangerous. Well, maybe except that last one. Let's not go overboard, people. Anyway, the point is if you haven't had the pleasure, nay, the privilege, nay, the HONOUR (yes, with an "our". I'm not kidding around) of indulging yourself in this deliciously decadent treat, I suggest you get yerself off your duff and bake these babies as soon as humanly possible. You will not be sorry. Step 1: Get your ingredients ready. And by ingredients, I mean these two ditties -- and that's all she wrote. If that doesn't entice you to make these, I cannot help you. Enjoy your boring old cookies. Step 2: Place a scant teaspoon, a lil' dollop, a scoch of Nutella near the wide end of each unrolled piece of dough. If you want to go cray-cray, add a small dollop of peanut butter, white chocolate chips, toffee bits, pumpkin filling, etc. as well. Use your IMAGINATION. Step 3: Then roll 'em up and shape them into crescents on a baking sheet. Easysauce. Step 4: Bake the crescents until they're nice and puffy and golden brown and you just can't take the ridiculously glorious aroma wafting from your oven any longer. And now, we stuff. Into our faceholes. Ahhhhh. Buttery, crescenty, Nutella-y bliss. Getcha some.